Any publication with Thomas Elsaesser’s name on it is cause for anticipation. This jointly authored volume reaffirms not only Elsaesser’s comprehensive command of the diverse theoretical projects that constitute ‘film theory’ but also the creative capacity of both authors to reframe concepts and debates in a way that shakes up and rejuvenates the field. At the very moment when courses in film/cinema are being absorbed into digital/screen studies, Elsaesser and his co-author, Malte Hagener, have undertaken a process of collaborative writing and translation to produce an agenda-setting book that connects cinematic thinking in the era of remix and mash-ups to the fertile beginnings and multiple trajectories of film theory. What the book offers is an original account of film theory not as a coherent enterprise but as a volatile history determined by shifts in cinema itself. The major innovation of Film Theory … through the Senses is the decision to reorganize this history by approaching cinema, in its many stylistic and technological modes, as ‘an affective and affecting aesthetic experience’ (172), involving the material body of the film and the sensory body of the spectator. Putting aside the dominant modes of classifying film theories, Elsaesser and Hagener begin with the idea of cinematic worlds and spectatorial bodies as historical variables. This approach attempts to break with the transdisciplinary humanities approach to screen studies and return us to the aesthetic experience of cinema. However, as the authors acknowledge, their thematic focus on perception, the senses and the body exemplifies a turn towards embodied theory evident across the humanities. That said, rather than repudiate classical film theory in favour of embodied, sensory film aesthetics, the ethic that informs Elsaesser and Hagener’s project is inclusive: ‘the task of the sheriffs and space warriors of film theory is to make sure no one and nothing is left behind in the radical move that cinema undergoes [in its ontological shift to the digital]’ (172). The great attraction of the book is the way it organises its variable history of film theories into a seven-tier model. Each tier theorizes filmic modes as distinct kinds of spectatorial space, described through metaphors of: window and frame; screen and threshold; mirror and face; look and gaze; skin and touch; acoustics and space; mind and body. Under these headings, Elsaesser and Hagener rehearse familiar debates, beginning with the classic divide between Bazinian realism and Eisensteinian formalism. In the process, they uncover ‘possible logics’ which bring established theoretical paradigms into new constellations. Each chapter offers unexpected connections between, for instance, Gilles Deleuze, Annette Michelson and Torben Grodal on cinema as brain, or Vivian Sobchack, Hamid Naficy and Siegfried Kracauer on cinema as skin and touch. It is these latter chapters on cinema as skin, ear and brain that initially capture the attention because they speak directly to our experience of contemporary film. However, the earlier chapters on canonical debates prove equally stimulating and pertinent to theorizing screen and sound media today. Precisely because it aspires to leave ‘no one and nothing behind’, the book is also a rich resource for remembering and reintegrating old debates into current teaching. 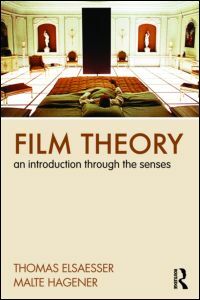 Without being overtly instrumental, Film Theory … through the Senses, is a truly useful text because of its origins in a series of lectures for MA students at the University of Amsterdam in 2005-6. These lectures were then expanded by others, tested on Yale undergraduates and translated into German by Hagener for publication in 2007. The decision to rewrite rather than retranslate the German publication into English involved further collaboration and new material on digital cinema and the senses. This additional material, on cinema’s ontological shift from the mechanical to the digital, is explicated in the concluding chapter, providing a retrospective rationale for the book’s enticing structure – one that rescues and resuscitates film theory for the present. This ambitious enterprise fills the considerable gap between textbooks written for undergraduates and the many anthologies that map and remap the major thinkers, movements and evolutions in film theory. Unlike most of these anthologies, Film Theory addresses the needs of advanced students preparing for postgraduate research at a time when the identity of cinema is at stake. Moreover, the book is an archival treasure trove for those of us who are grappling with how to teach cinema within new kinds of media programs. In 2011, I had the pleasure of working through several chapters of Film Theory … through the Senses with my fourth year Honours students, starting not at the beginning but in the middle with the chapter on cinema as skin and touch. My aim was to facilitate a shift in student interest from questions of representation, ideology and narrative to non-representational aspects of contemporary cinema. Elsaesser and Hagener’s focus on perception and the body opened the door into another recent rewriting of film theory, Elena del Rio’s rethinking of feminist and Brechtian theory in Deleuze and the Cinemas of Performance (Edinburgh UP, 2008). What Del Rio shares with Elsaesser and Hagener is a strong interest in the affective aspect of cinematic experience, together with an ethical approach to feminist theoretical work of the 1970s. Having worked through both books, in their final essays several of my students returned to Elsaesser and Hagener’s chapters on cinema as skin, ear and brain in order to think through and articulate affective aspects of cinematic performance. Their encounter with both books proved productive: over time, strong resistance to film theory as obfuscating, overwhelming or simply irrelevant gave way to the discovery that even tentative encounters with the field – its twists and turns, trends and passions, densities and discourses – can revitalize and deepen our engagement with cinema. As for me, reading Film Theory … through the Senses with my students has eased my transition from the home territory of cinema studies into the chiasmic world of digital arts, media and screen studies. In the company of Elsaesser and Hagener such a transition, potentially, leaves no-one and nothing behind.